The philosophical project of phenomenology, as conceived by Edmund Husserl (Ideen zu einer reinen Phänomenologie und phänomenologischen Philosophie, 1913), aimed at examining the structures of subjective experience so as to recover the primordial. The task of the phenomenologist was to focus on the immanent object of investigation as it appears to consciousness, without making any claims about the transcendent reality. The topic of this session will be the ‘theological turn’ in phenomenology which has been the focus of recent works of French philosophers such as Jean-Luc Marion, Paul Ricoeur, Michel Henry, and Jean-Louis Chrétien. Despite the wide range of questions that their texts address, the issue which they all have tried to tackle is whether the investigation into the immanent may or may not open the possibility of the transcendent horizon. What does it mean for a phenomenologist to be open to the thing itself? Does the phenomenological respect for immanence oppose the religious claim of a given transcending the constituting I? Is it possible that the meaning of God and transcendence may be recovered through a radical analysis of the immanent? Is the ‘theological turn’ in phenomenology a transgression which goes against the basic principle of its methodology or is it possible to cross the horizons of the immanent and approach the transcendent through the phenomenological investigation? If every phenomenon needs to be reduced to the constituting I, is it possible to conceive of absolute and irreducible phenomena, such as God? 1) Jean-Luc Marion, 'Metaphysics and Phenomenology: A Relief for Theology,' trans. Thomas A. Carlson, Critical Inquiry, Vol. 20, No. 4, Symposium on "God" (Summer, 1994). 572-591. 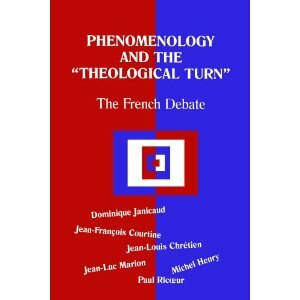 2) Dominique Janicaud, 'The Theological Turn of French Phenomenology,' Phenomenology and the "Theological Turn," trans. Bernard G. Prusak, New York: Fordham UP, 2000. Chapters 1 and 2 (pp. 16-49). 3) Martin Heidegger, 'Phenomenology and Theology,' trans. James G. Hart and John C. Maraldo, Pathmarks, Cambridge: CUP, 1998. 39-54. You can download all three texts from our Reading Materials page.